I Love My Amazing Animals: Giving a little sunshine! Hello my friends, as many of you remember a few weeks ago, there was an EF-5 tornado that hit Joplin, MO and the damage was horrifying. 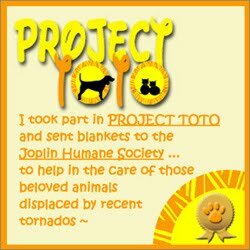 I heard thru the blog world, over at Tanks blog, that the Joplin Humane Society was in need for fleece for all the displaced animals that they are taking care of. If you want to help out yourself, please go here! Once you do, you can display this nice badge on your blog too! 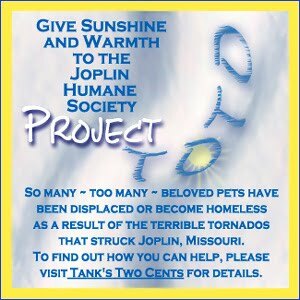 For more information, please go here....It's never too late to help! You are right. It's never too late to help!